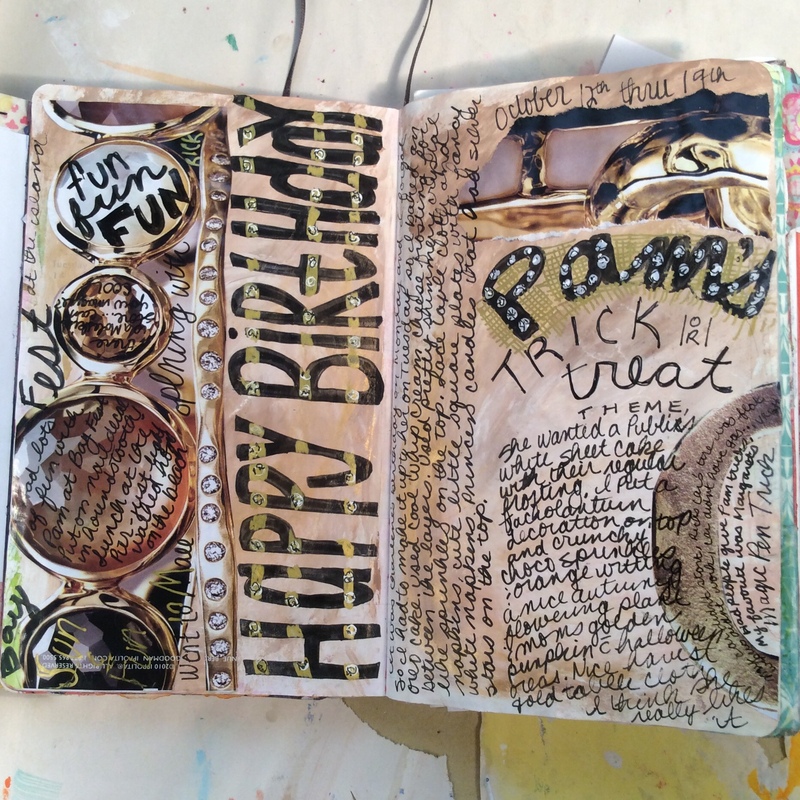 10/10/15 How Often Should I Art Journal? Daily? Weekly? Monthly? Whenever? 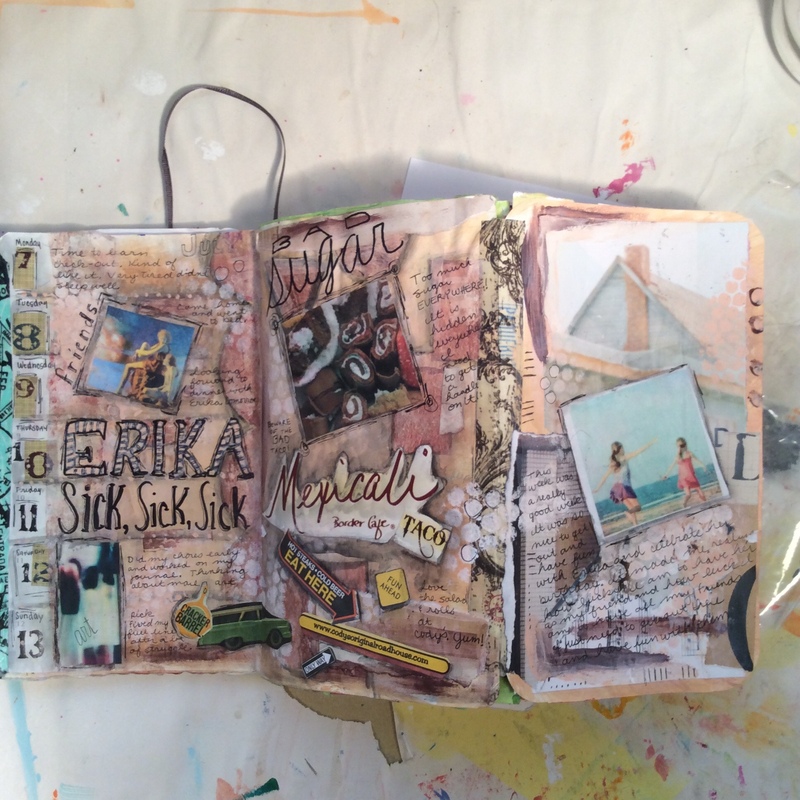 So how often should you art journal? 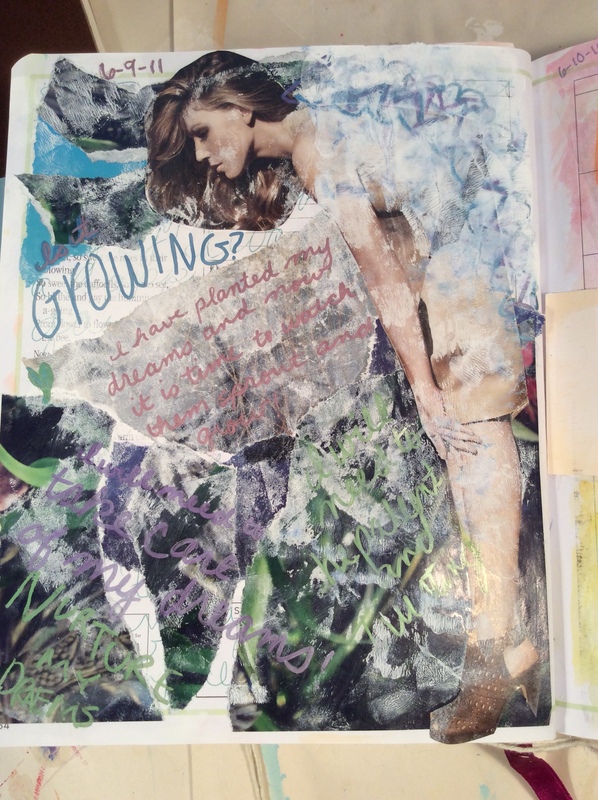 And why am I even asking that question when my goal is to practice art journaling every day? Good questions. The reason I ask is really due to formats. Formats? What the heck are formats? 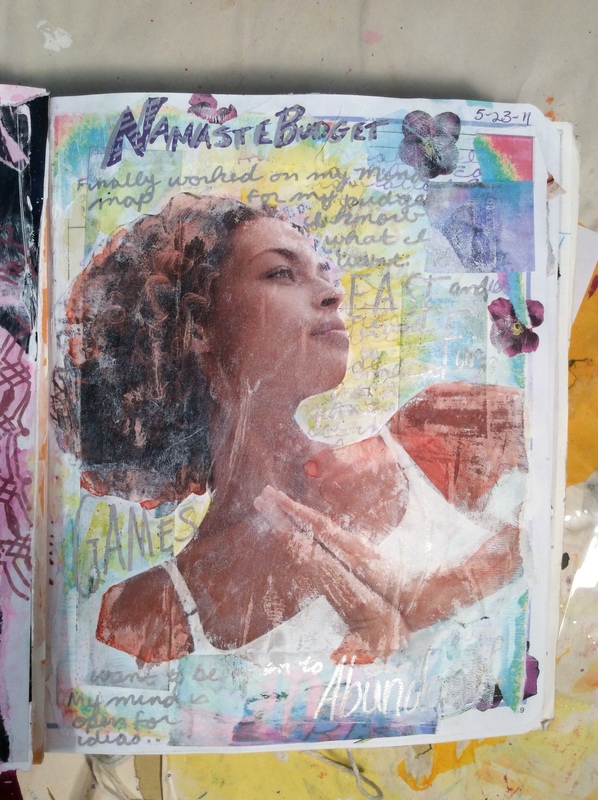 When I have been true to my art journal practice and actually journaled everyday it didn’t mean I did a page everyday… and it didn’t mean I didn’t. What? 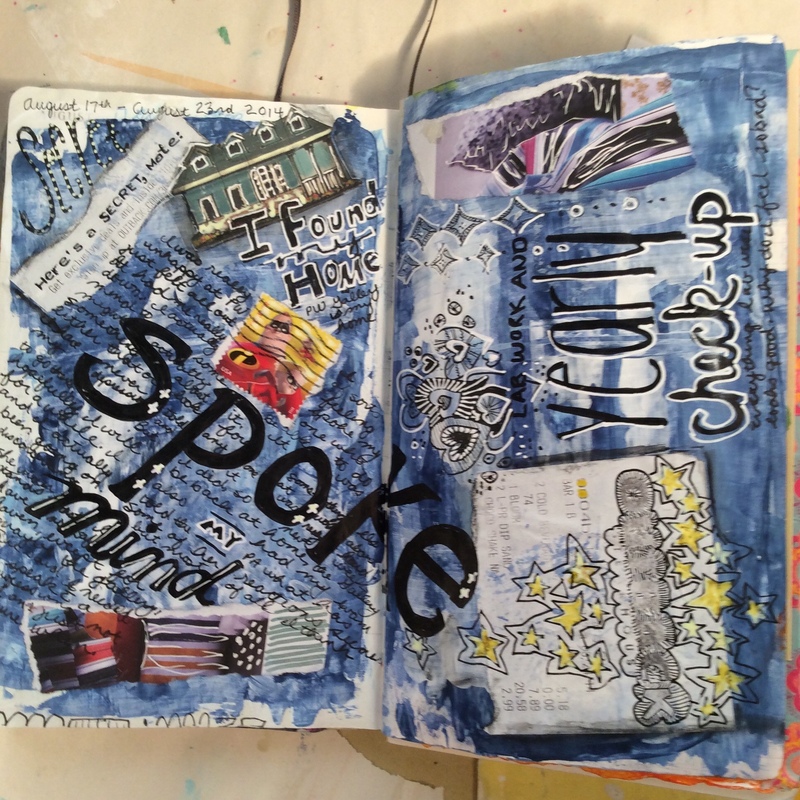 At certain times I “art journaled” as I could, everyday. And there was a time when I did an entire page each and every day. That’s where a “format” comes in. It really isn’t so much a strict set of rules on what to do but rather a guide. For example: I had a job not too long ago where I actually had a full hour for lunch. 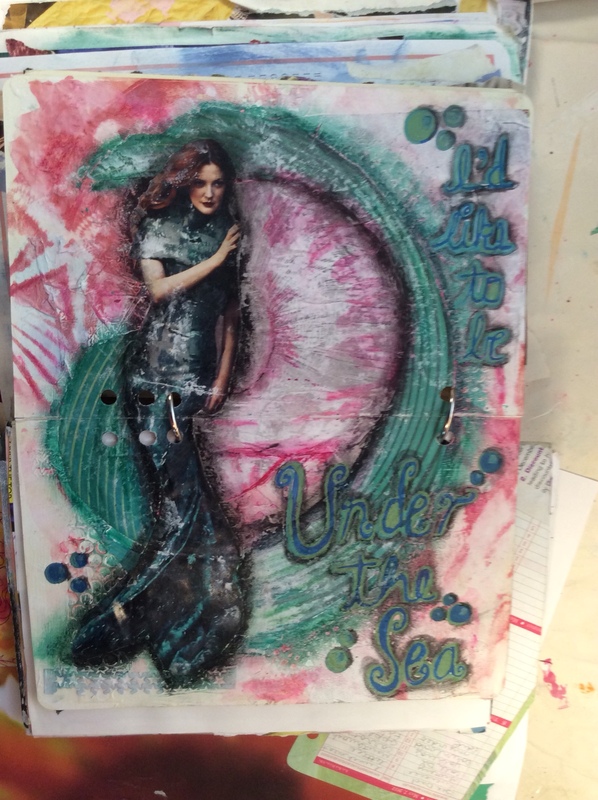 While I was at this job I actually worked on an art journal page at lunch every day. My format was daily. 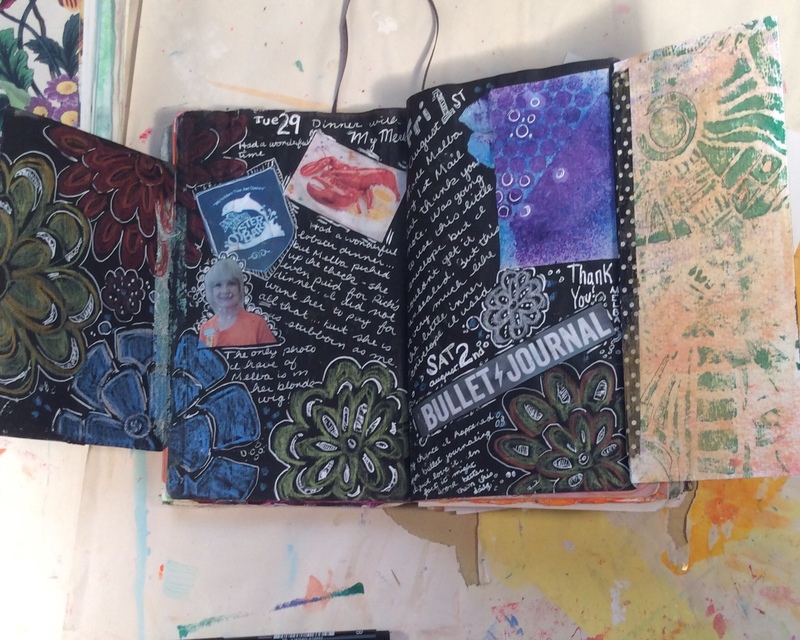 And I look back at my journals from this period and am truly impressed that I was able to do so much art journaling. Also, because of this hour of time, doing a page didn’t feel like a chore at all. In fact it was a really nice way to blow off the steam and stress of a busy day. 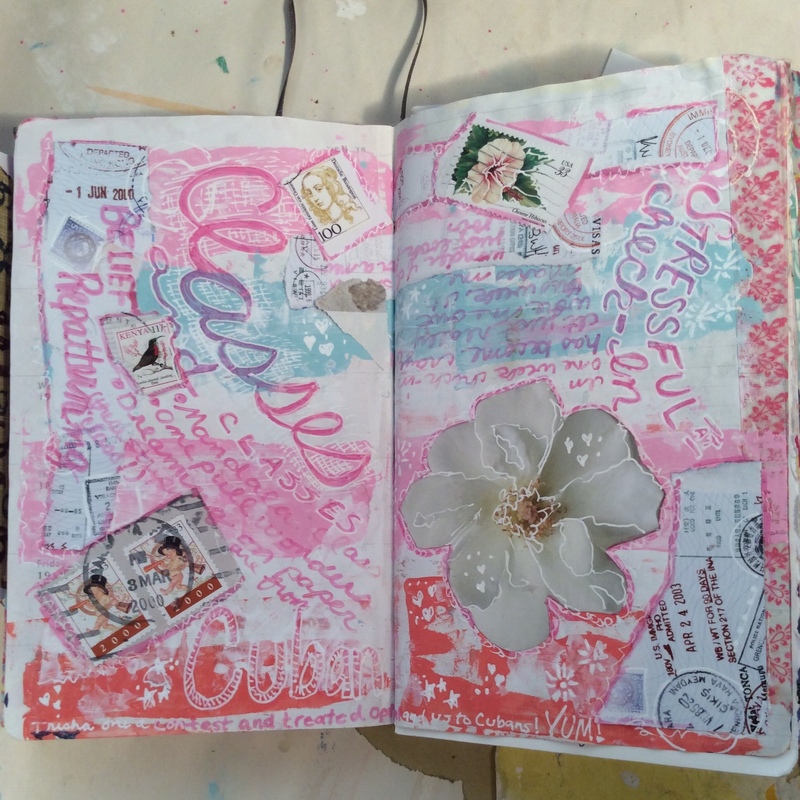 What I loved about this format was that I got lots of art journaling practice. I was able to complete lots and lots of pages. 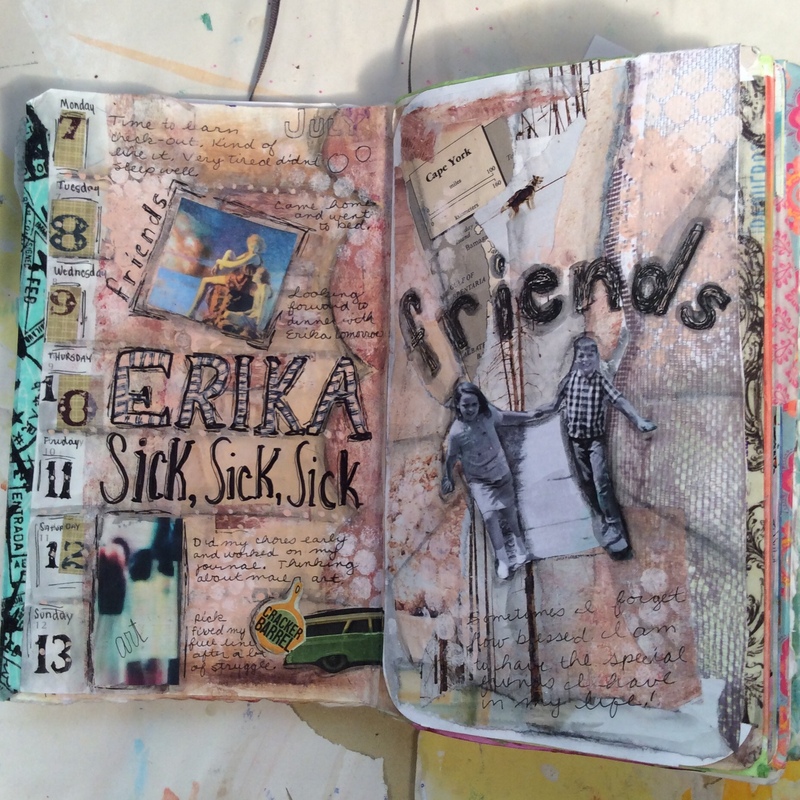 I was able to make lots and lots of really cool art with some journaling added in. 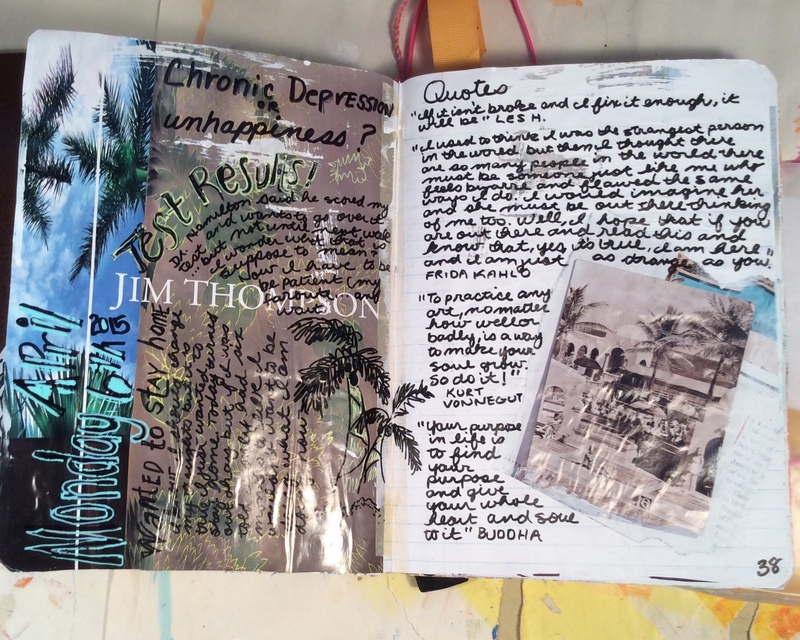 When I look back at these art journals, I can see my art skills and style really develop. Then my job changed and my format changed as well. There was no more hour lunch breaks. Bummer! 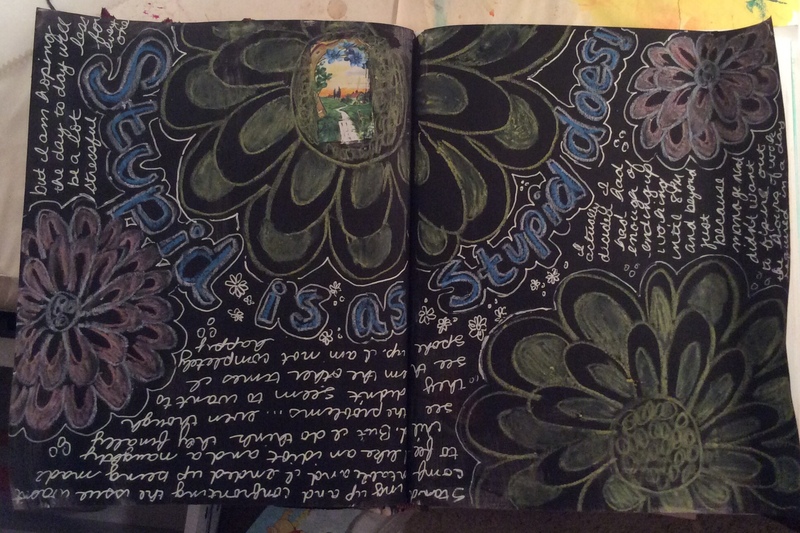 Half hour was all I get and that leaves little to no time for art journaling. So, I started out preparing background pages in a journal. I did about 15 pages per week. So I would have something on the page to start out with. 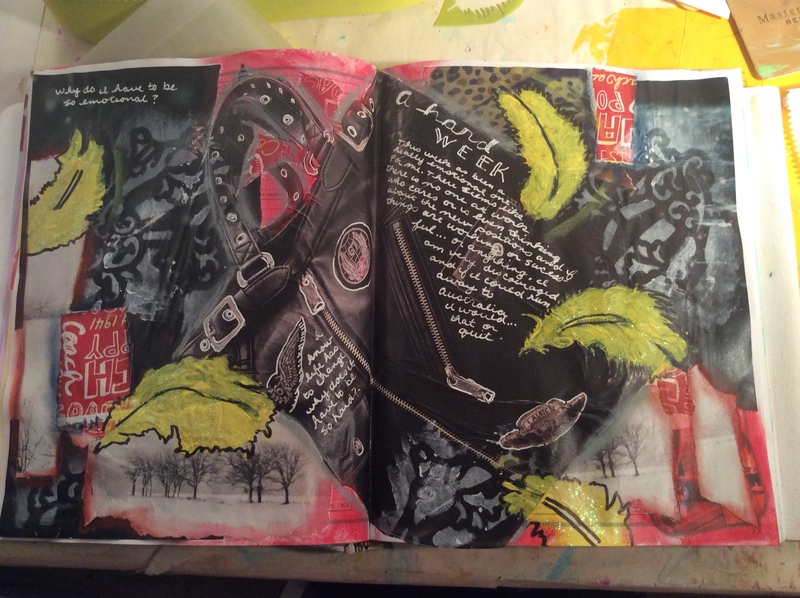 Then my art journaling was more of a journal entry style. 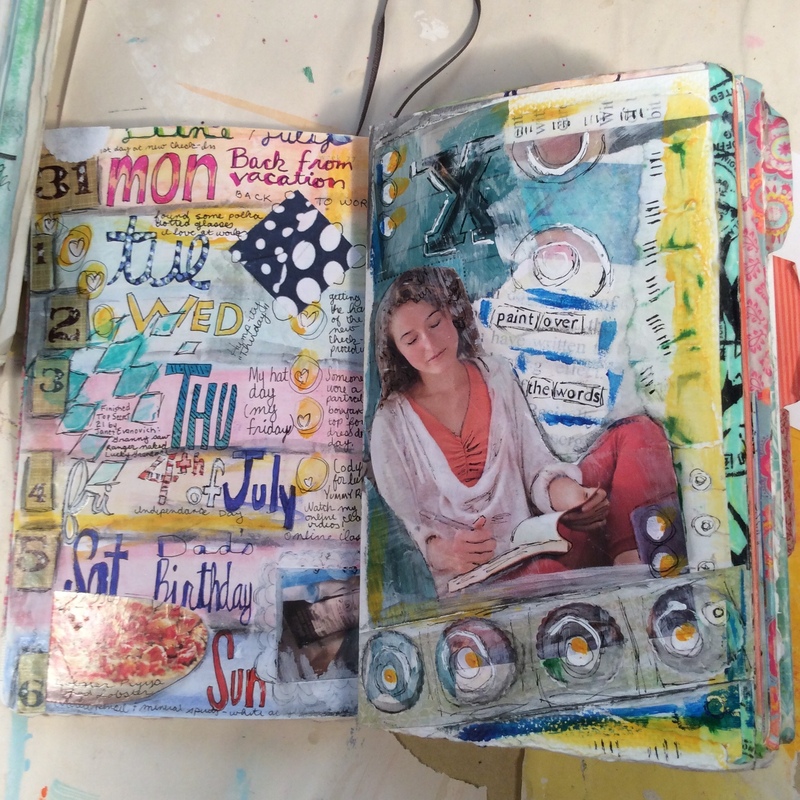 I would add collage, lettering, doodles, journal entries based on what happened of note during the day. I might use a quarter of a page one day and two pages the next. And it made getting something down every day really easy. This was a Daily Open-ended format. 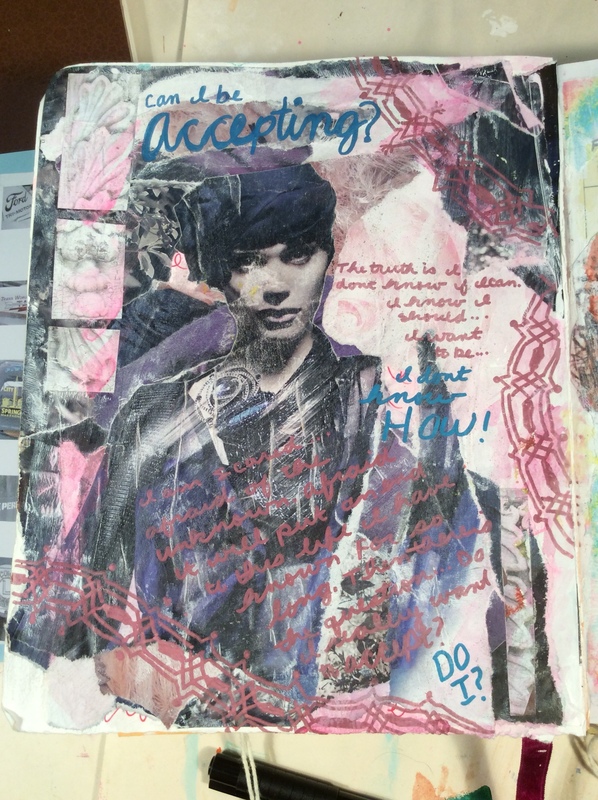 What I love about this format is that it was more of a hybrid art journal/written journal. There was less focus on the art and more of a focus on reflecting my day using art and writing. 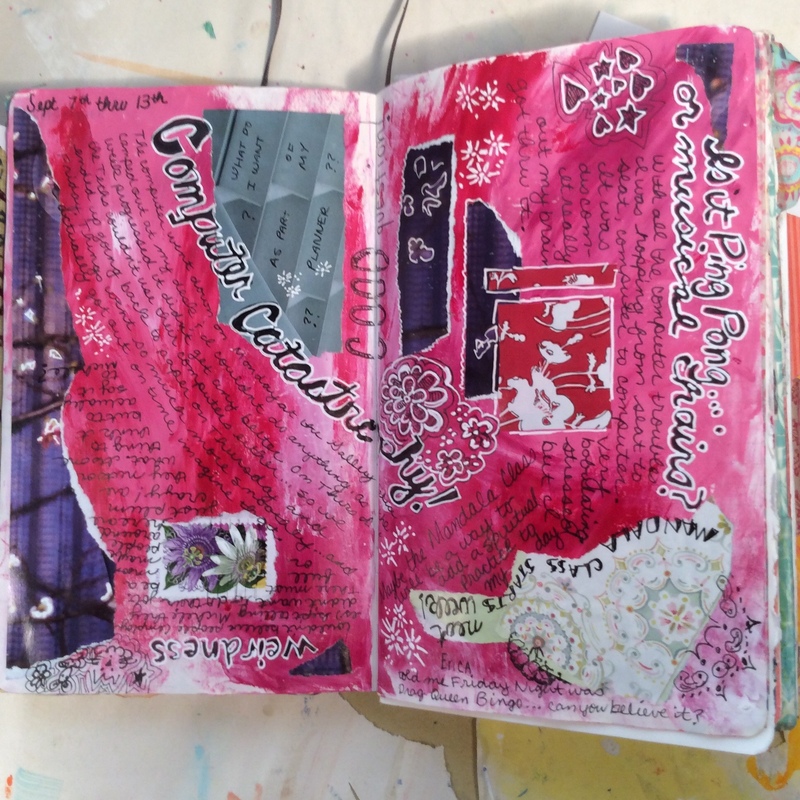 My Daily Open-ended art journals really reflect my daily life during the period more than any other format I have used. 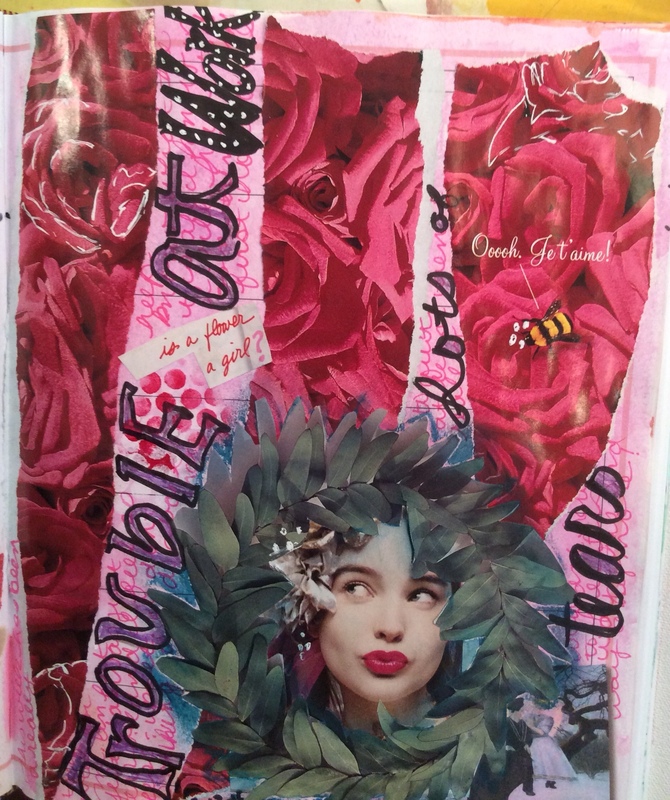 The format was changed abruptly when I decided to do a “Weekly Challenge” and after I took Dawn DeVries Sokol’s Art Journaling Class (thru Creativebug). 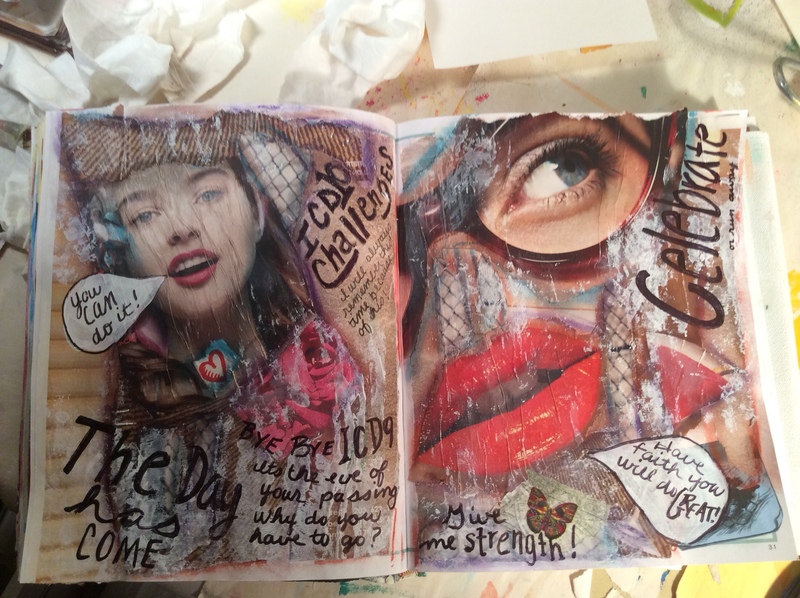 I started doing a weekly art journal challenge, so during the week I collected bits to add and make my pages and on the weekend I created them. I loved the pages I made. I actually did lots of painting and drawing with my bits from the week. But jamming all the creative work into the weekend didn’t really work for me. After I took Dawn’s class, I changed how I did this weekly format. I actually made a background on a two page spread on Sunday. Each day I added something that happened, a picture, a receipt, a doodle… by Saturday I had a finished page that reflected my week. This was a weekly format. 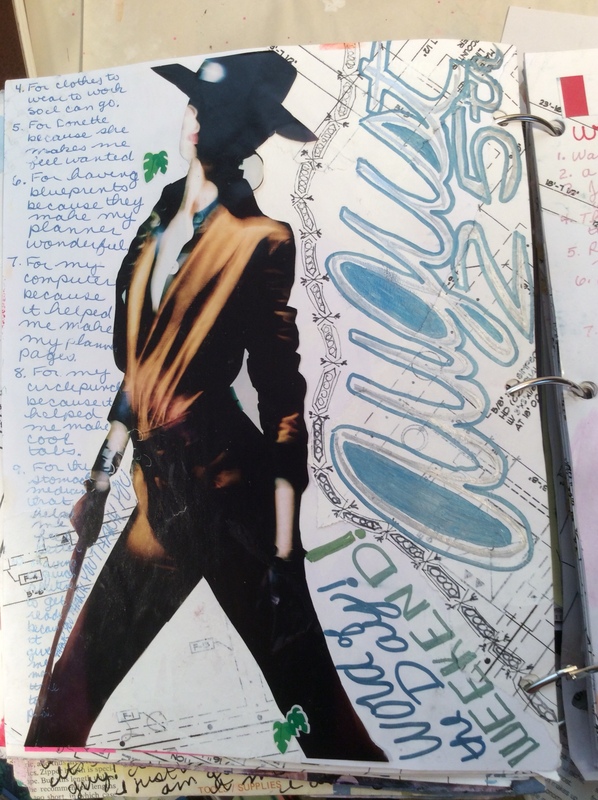 I look back at the weeks that I worked in this journal. I really loved how it came out. 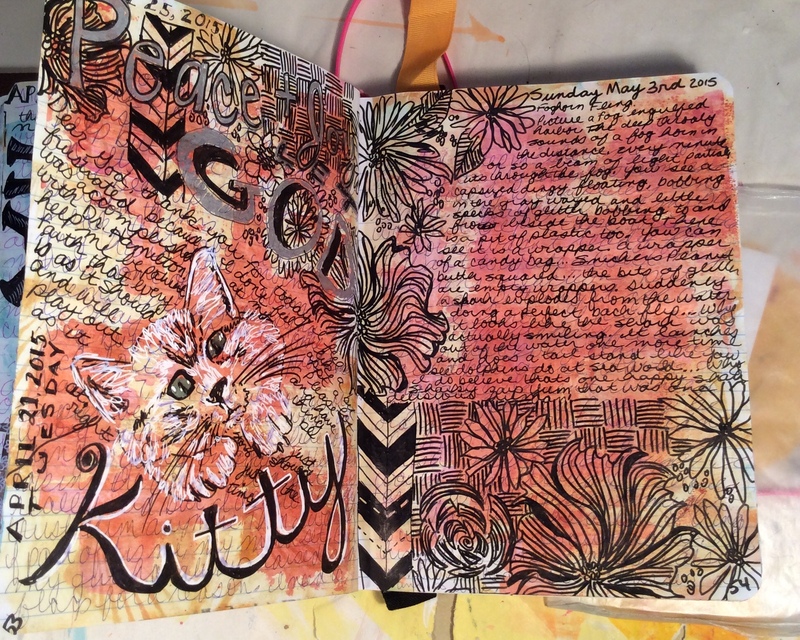 There is a certain style I developed, learned from Dawn’s class, and practiced on my weekly pages that I just love, love, love! What was really nice about this format is if you are limited in time you can spend 5 or 10 minutes a day adding a bit or two to the spread and by the end of the week you have something wonderful. 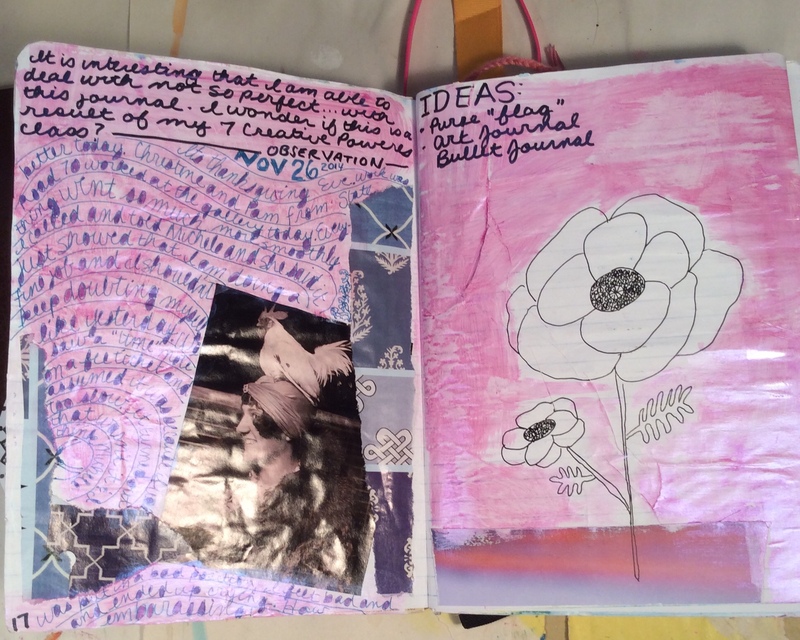 I wish I would have finished this journal and filled in every page… but I didn’t… but I still could! 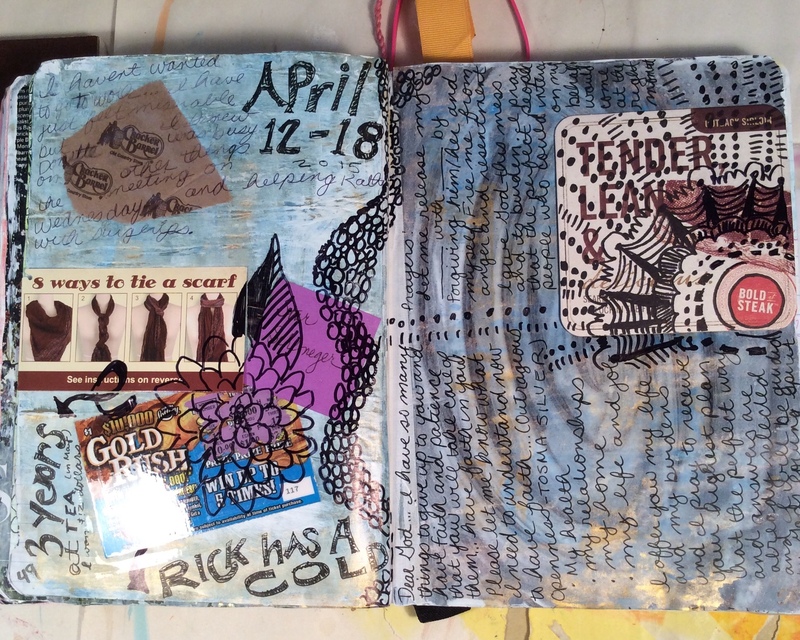 Then I changed again, as I often do, and ended up doing a daily doodle kind of journal out of a Junk Journal. I had started getting burned out and wanted to do at least something everyday. 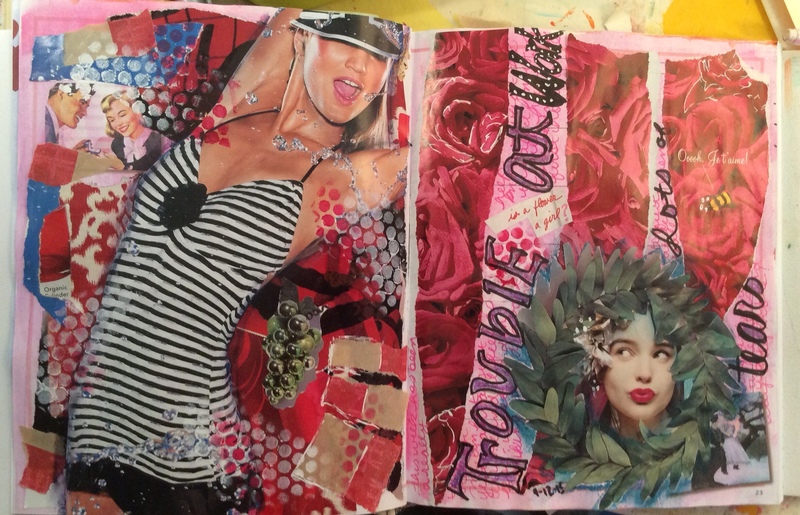 During this time I also explored Bullet Journals and new and improved Junk Journals. Then I stopped. 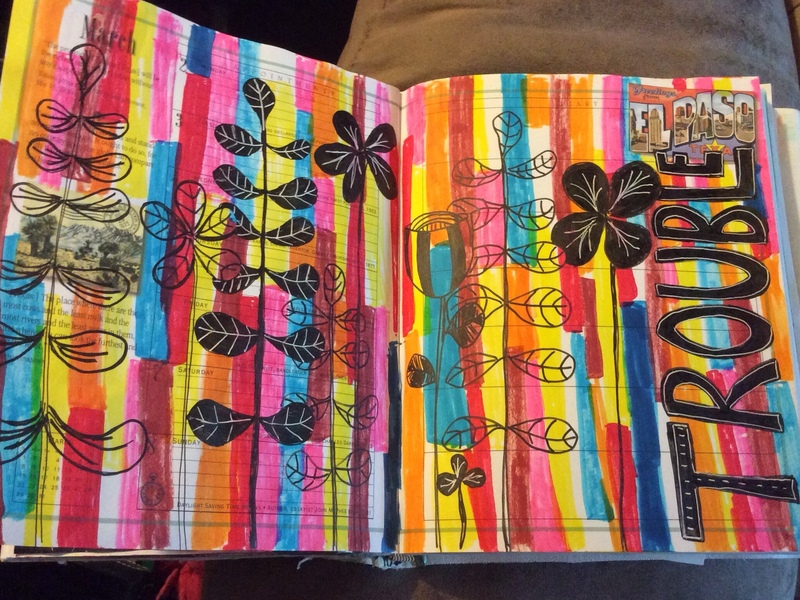 I stopped doing any journaling and took a break due to burn-out. 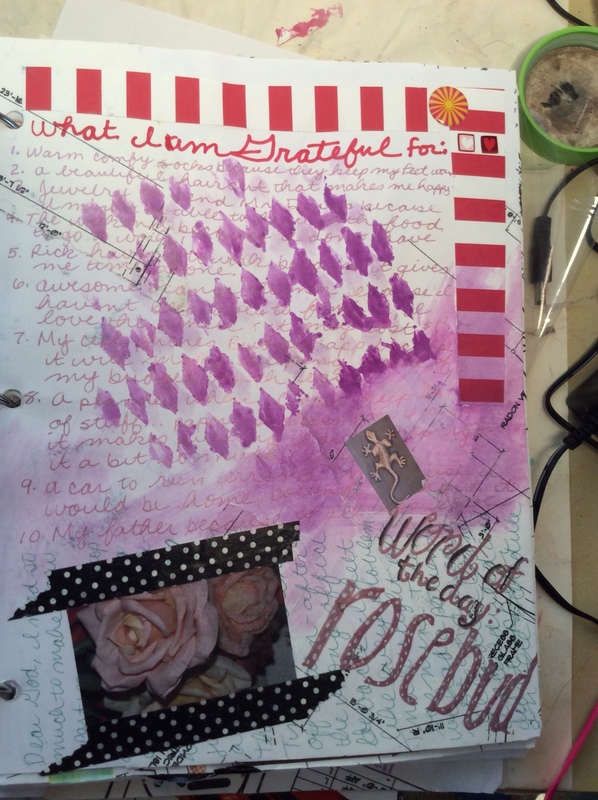 When I started journaling again, my goal was different. I didn’t set a page amount, or a daily amount, or any of that. I set a practice. 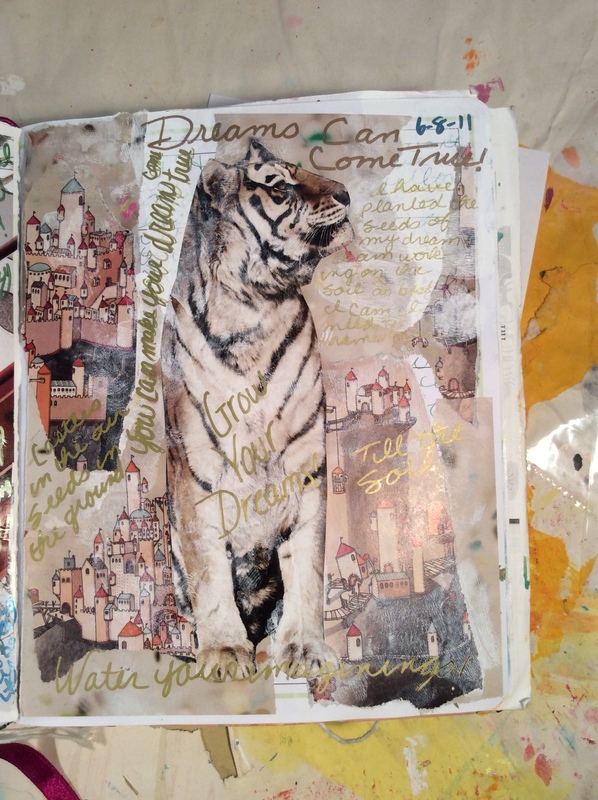 I would practice art journaling everyday. It didn’t matter what that practice was… or how long I spent on it, as long as I practiced in some way. I didn’t want to burn out again so I was gentle and set a very open-ended goal. 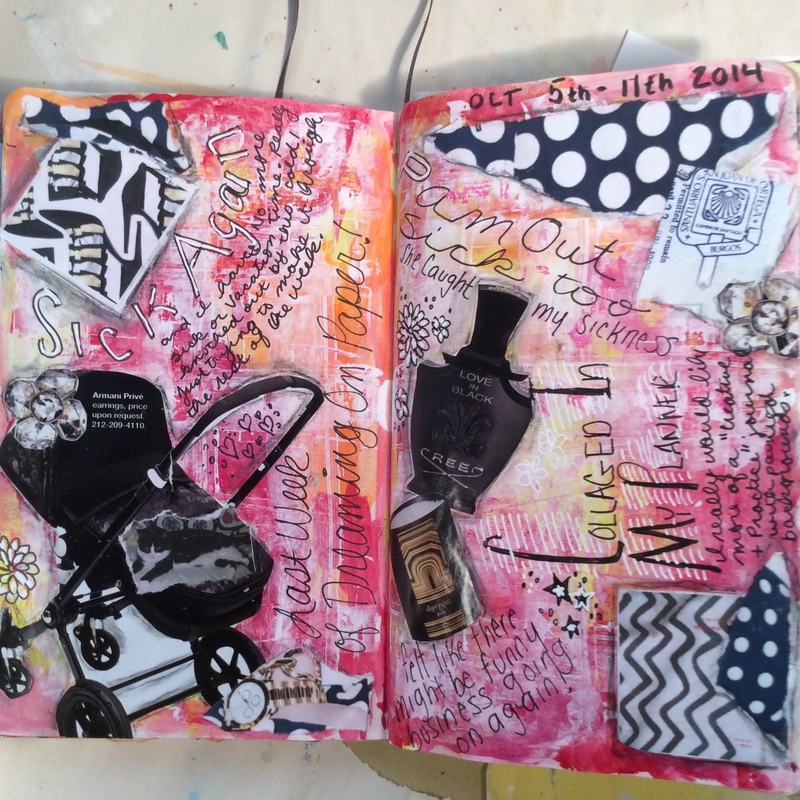 So my most recent pages, the ones I have been sharing on this blog, are the result. They are kind of a Daily/Open-Ended hybrid format. So what format do you use? Does it work for you? Do you love the results? I would love to know!! 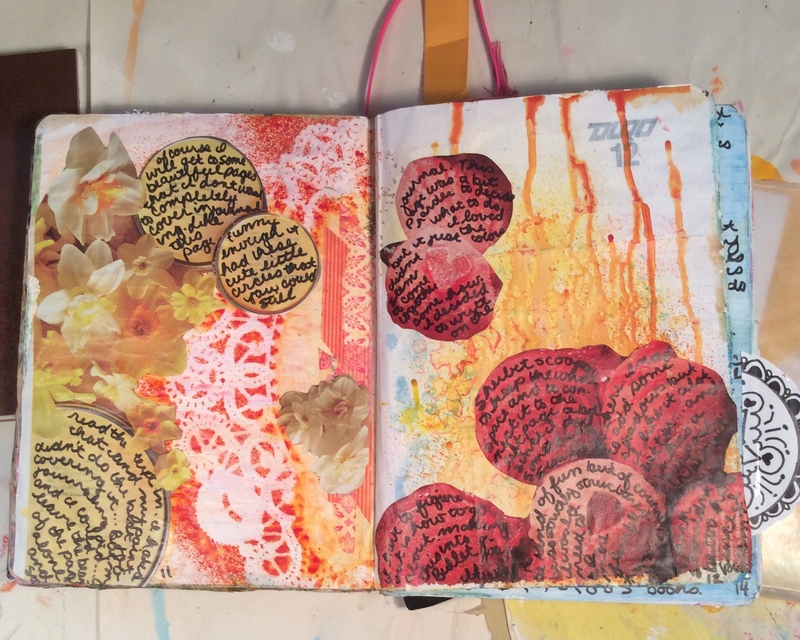 Hi, really love’d this blog and you’re explanation about the different ways you fitted art journaling into the routine of your life. I also like how you now see it as a practice and have taken the pressure of completing a certain amount. I use that concept with all the different parts of being a working artist. As long as I’m doing something toward my professional practice, it’s enough.Dropping the pressure to do it perfectly, more or better kills the creative spark, just allowing myself to do something keeps the creative flow happening. Keep up the great work! Thank you so much for your comment! It is nice to know I am on the right track. It is also really cool to be able to hear from a working artist! I use the daily/open-ended format (using your words). I have two goals. The first is to write every day. This doesn’t always happen but I try. The second is to fulfill my need to glue or paint. I get frustrated and unhappy when I don’t glue or paint. 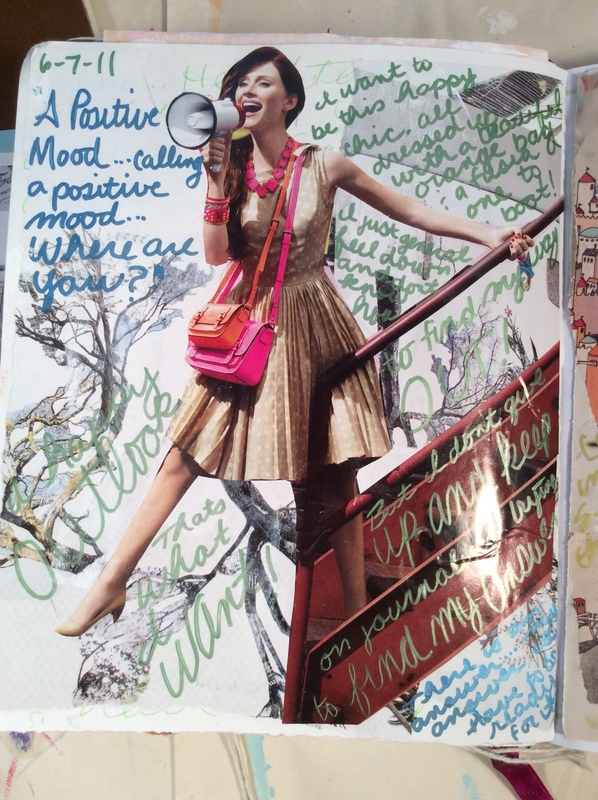 Mostly I combine the two goals onto one page, or spread. I hardly ever plan my pages. 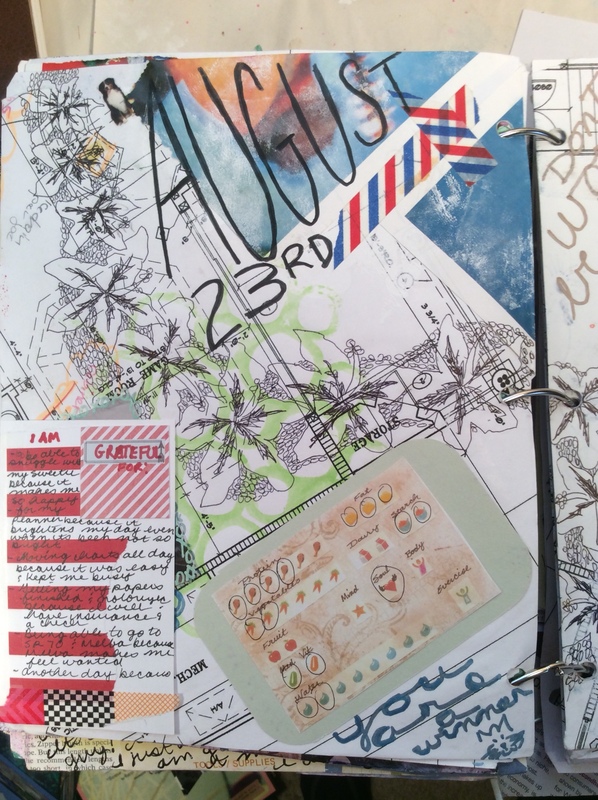 And then there’s the art journal with heavy-duty pages for planned spreads. 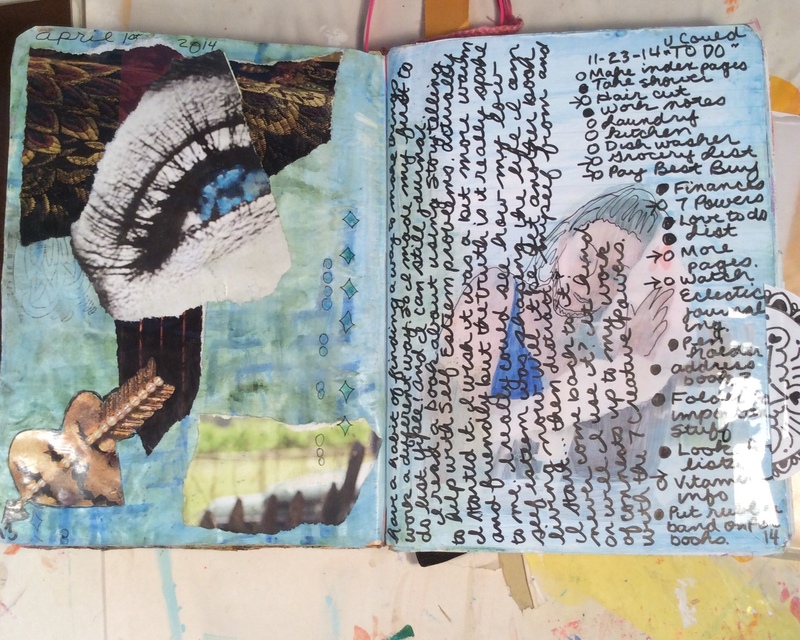 I like to work in different types of blank books, so as the paper/substrate of my journal changes, so do my expectations. I have found that it just is not feasible for me to do something EVERY day. I have a more than full-time job and other functions that I volunteer for during the week that often take a lot of time. I am also married which adds another time demand. So, I have finally determined that I will journal or do backgrounds or work on foregrounds or scan and post or anything…when time allows. It really helped giving myself the freedom to not feel pressured to produce. Now when I work I am fresh and ready and much, much more productive. I usually get 2, sometimes 3, good sessions in per week and that seems to be working really well for me…right now…. But the holidays will soon be here and I’m sure things will change again! I have been sick the last couple of days and have felt really bad about not keeping up with my practices. Your comment help me really see how I just need to give myself a break! All because of your comment, thanks! Awe, that is so sweet for you to say. I think sometimes we get caught up in the flurry of all that we really WANT to do and it becomes work and isn’t as much fun any more and burnout sets in. I’ve been in this cycle a few times but I think perhaps now I might actually start listening to my body rather than exercising my mind and pushing myself to some less enjoyable place. It really is OK to step back a little. I have to remind myself of this almost on a daily basis. It was really interesting to read how you have managed to fit art around whatever the shape of your free time has been. The important thing is to make the time to be creative, right? Whatever time that might be, it is something. 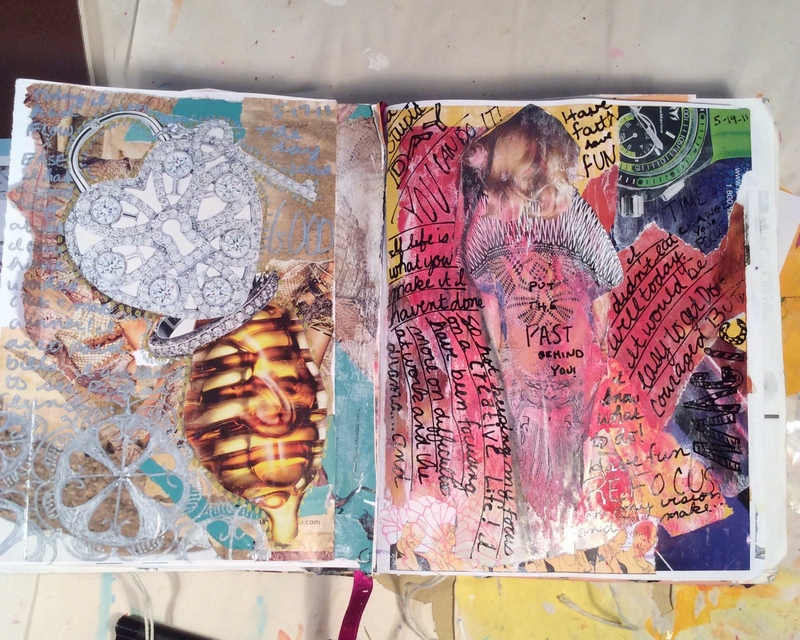 I aim to work in my art journal at least once a week. 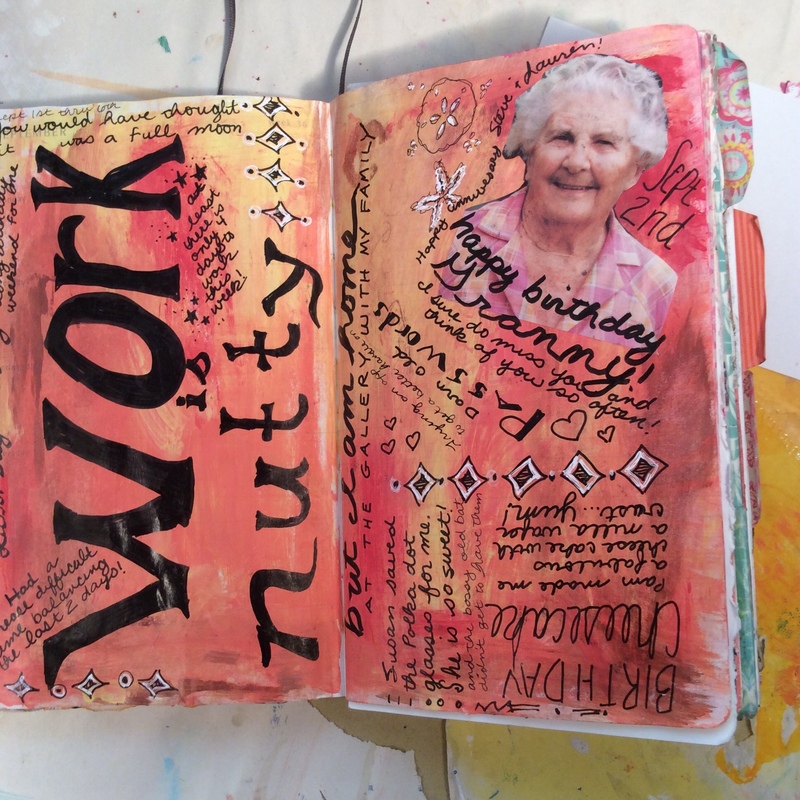 That is why I do the Documented Life Project: the weekly prompt makes me sit down and produce a completed page otherwise I might let time drift and never get a page done because life is so busy. I try to find time to work on my art generally, however, a few times a week so I just work on a piece in snatches of time until it is complete. I break projects down into stages and chunks for that reason. Thank you SOOOOOOOOO much for sharing the link to NaNojouMo with everything!!! I will hop on over and take a look! 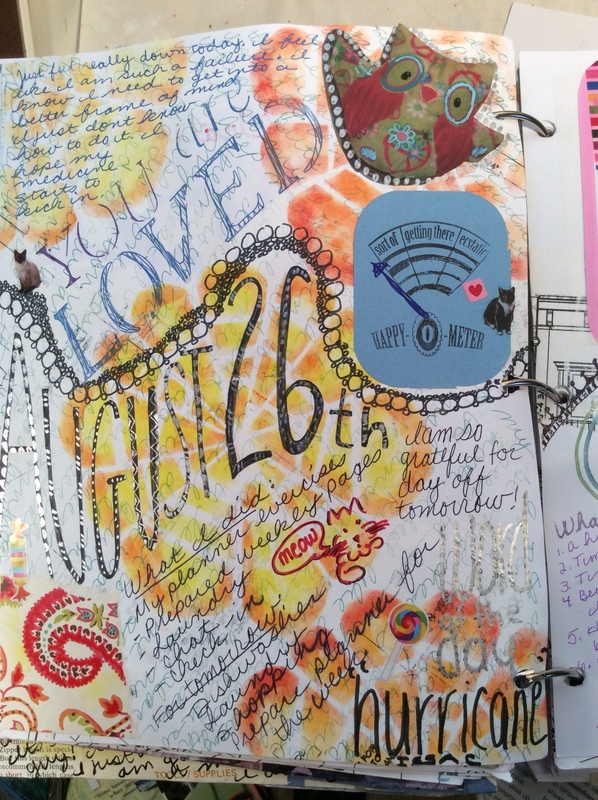 I was doing the Documented Life Project last year and just went through my journal. That was a fun time and I did a lot of very artful fun pages. But it became a chore for me to block out time every weekend and I made myself feel like I had to do my pages every week or else… which is never a good thing. So I stopped, gave myself a break, and started to do just what I could in the time that I had. Great! I hope you join in with the NaNoJouMo thing on Iris’ site. She has a FB page for it too. I think 15 minutes is really manageable. I’m hoping it will loosen me up a bit too as I won’t have time to overthink it.